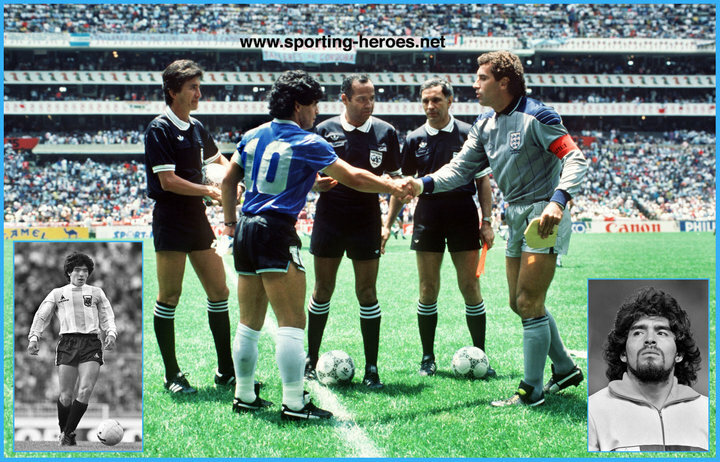 Cybereagles • View topic - Is Messi now better than Maradona? Is Messi now better than Maradona? Post subject: Is Messi now better than Maradona? Methinks so. Your thoughts? I think he can do everything that Maradona did plus more. Post subject: Re: Is Messi now better than Maradona? Best of his era. Lets leave it at that. We'll never agree on this. Give Maradona the same technological and fitness advantages and lets talk then. Today messi plays with a ball thats light, synthetic boots, the best physicians in the world and diet plus a total lifestyle dedicated to the sport. Is he better? Is Bill Gates richer than John D Rockefeller? Why do you make it sound like Messi's's opponents play with a different soccer gear. They don't. However when you're at that legendary level, those little things count. It's like comparing lebron to jordan who played when the pistons would literally beat the snuff out of you or to wilt who played a virtually different sport. Or comparing a quarterback of this era vs the guys from the days of the steel curtain or the 85 bears. Different rules, different abilities. I'll never forget what the italians did to maradona in 82 (read: gentile in particular). Leo is the great of his time, lets compare him to ronaldo, i'll find it hard to say he's the greatest ever though because the sport's evolved so much that it's an unfair conclusion to make. Like i said, is bill gates wealthier than rockefeller? Is ms world today prettier than ms world of 1950? These are arguments without a solid footing and sentiment based. Messi is great as maradona was then. Different eras, tough to call. He needs to leave barca to surpass Diego .. Diego played in Boca, barca and Napoli and played in two world cup finals in 1986 and 1990. Your conclusion is on the right path...how you arrive at it is baffling at best. Henry destroyed England as did Ronaldo and Messi is far better than both men. As for the WC argument, that's wholly unfair. Is Totti any less a player because he has played only at Roma? What of Del Piero? What is the point you're aiming for? Pele is unique because he delivered for Santos and most importantly the National team. The National team is where the rating is more. Not saying that club football does not count, but Del Piero became a true Azzuri legend and not Juve legend when he won the World Cup in 2006, same with Totti. Nonsense. He's known as a very good player for BOTH club and country. @Benedict, this logic is dumbfounded and fathered by foolishness, desist such practice and leave it for the Cristiano Clan. Messi, if ever to arrive on English soil, would do so in the strip of the league's best. Just as United adjusted their shape to allow Cristiano to flourish, any club receiving Messi would do the same. Rooney was shifted wide to add the defensive graft that Cristiano was allowed to neglect. Messi would be played in a 4-3-3 with everyone doing his dirty work...Would he notch 50 odd, perhaps not, the gulf in class between the top and bottom isn't as grand canyonesque as it is in La Liga, would he dazzle, delight and prove other worldly? Absolutely. The man is a genius, his only flaw would be...he knows where, he knows when and he knows what time's kick-off. Such a simple question on the surface but complex to answer especially since they played in different eras. Skill for skill perhaps yes (especially if you remove the wonder goal against England from the equation lol) but overall for Argentina it's Maradona until Messi leads them to a WC win. In fact at the last WC in Brazil, Messi scored almost all his goals in the group stage while Maradona scored all through. Club accomplishments Messi has surpassed Diego, Messi also owns the youth accomplishments with a WYC and Olympic titles while Maradona has the one WYC win. As a national hero Maradona, but as a better player I'd probably say Messi. Maradona has a WC and has done it at more than one club, surely that can't be discounted. The mere fact that messi can't really do it for his stacked Argentinian team tells me all I need to know. ^Stacked in one department and shambolic in others. Argentina are as balanced as Lolo Ferrari or whatever her name was, on tiptoes. They got to a final with Messi prominent in their progress, thats a decent return, not great, but decent. Football has changed since the days of old and t'is harder for the individual to do it alone, for all the great names on the pitch, twas Mario Gotze who dragged Germany over the line. And then there's Portugal, what did worldly great Ronaldo do at the big dance? Pirlo? Balotelli? Benzema? What of the myriad Brazilians, in their homeland, what did they do neath Christ the Redeemer? Its more a team game today and more often than not, the better team, with that term encompassing every aspect of the word, bagging the gold. Germany were the most complete team, Argentina were just top heavy, which leads to the question, pretty face, decent derriere and modest breasts or a bra-busting pair of sweater cows and nothing else? I dont think we've ever seen or ever will see anything like Lionel Messi again...Brethren, lest we forget, in years to come, those fans of the great game will be able to talk tales of having watched the extraterrestial play. Just as yesteryears talk of Peles and Bests, Diegos and Cruyffs, we have all been of the absolute fortune and serendipity to see the greatest of modern time in his prime. When folks talk of the sport of kings and debate the bests, consensus inevitably settles with Ali, one never had the joy of watching the rope a dope and shuffle, late 80s early 90s Tyson, remains the greatest of heavyweights in one's blinkered eyes, oh to have seen Ali in his prime as the old folks did. Alas, today has given the audience Messi and Mayweather, the annals of history will talk of their greatness and we will be considered the blessed generation who got to see their brilliance. An honour and a privilege. Oga boss, was the Maradona team of the 80s a balanced team? As long as Messi doesn't win a World Cup and stays in Barcelona his entire career I feel this is one of those things that people will debate forever. It's all opinion despite what his stats say. Messi is a goal machine at a rate seen never before. Does he benefit from the Barcelona midfield? Yes. But lets remember he won the WYC, Olympics, and reached the finals of the World Cup without that same midfield. Doubt anyone has the same kind of prodigious talent. You should see "Messi" the movie (see below), then come back and continue with the discussion. ^^Was alot more balanced than the nonsense they have today and add to that the pragmatism of Billardo, he created a side hard to beat, energised and accommodating of without overburdening the genius of Maradona. Look at Argentina today, no shape, no strategy, a free for all, with the only shred of game plan being to get the ball to Messi. Billardo, brought pragmatism to South American football at a time when industry was starting to overcome flamboyance. In the last two world cups, the Albiceleste have been more Marie-Celeste than anything else, yes, they sparkled in the frying pan, but were vanquished in the fire. Maradona was a weird scientist and the less said of Sabella the better, his journey to the final defies all logic and explanation. One would put it you that in '86, Argentina had an a*s that would swallow up a g-string and up top, two bee stings, with more than adequate anaphylaxis. Today, they're Katy Price, all up top and nothing else.